In 2010-2012, we thought speculation of a Greek exit were over the top. Some bookmakers suggested the odds that Greece would leave were as high as 70%. As the crisis flared up again in late 2014, and here in 2015, we again argued that a Greek exit is not the most likely scenario. It was a ploy to add pressure on the Syriza government to capitulate to the demands of the official creditors. Although we have been more optimistic than many investors, our views are becoming more mainstream now. We sketch them out here for your convenience. 1. Greece's debt is not a moral issue. It is primarily a political issue. 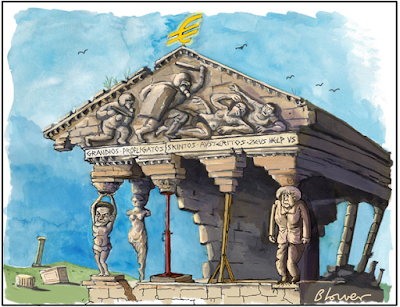 The issues cannot be resolved at the finance minister level (Eurogroup). It requires the heads of state. 2. We argued that the link between Greece's debt and EMU membership was not proper. By treaty agreement, monetary union was irrevocable. By claiming the Greece's debt is unsustainable and that debt relief is necessary, the Syriza government did not violate any law. The EU had promised some form of debt relief in 2012 conditioned on Greece satisfying the creditors' demand, including achieving a primary budget surplus, which it did. The IMF has also called for debt relief, coming from the official creditors in Europe (not that it, the IMF, would participate in such an effort). 3. We have argued since February that Greece's had a geo-strategic importance (link to FT op-ed) that was being ignored in analysis and discussions. Others have written about this since. It is clearly a concern for US and NATO officials. Merkel appears to have come around. We warned moral righteousness of the official creditors threatened to turn a dysfunctional country into a failed state. We see now others are also becoming concerned about Greece becoming failed state. 4. Most observers and analysts focused nearly exclusively on the sovereign debt schedule. The large payments due to the ECB in July were highlighted as the real potential limit to Greece's solvency. Instead, in recent weeks we have emphasized that the more urgent constraint was on Greek banks, which were running out of collateral for ELA borrowing. The ECB has now raised its ELA ceiling three times in the past five business day, and may do so again before this week is over. We would argue that the German press reports saying that Greek capital controls were imminent and EU officials talking about Grexit encouraged the flight of deposits from Greek banks. There has been a clear acceleration of the run on deposits in the past week. 5. Contrary to the treaty prohibitions against fiscal transfers, the EU lent Greece money so it could service its debt to the private sector. It is the EU, and later the ECB, that put taxpayers' money at risk. Greece did not borrow from German taxpayers. German banks bought Greek bonds. The decision to involve German taxpayers was made be elected German officials. 6. The first two assistance packages for Greece were aimed at preventing the contagion from spreading to large European banks. They were not aimed at putting Greece on a sustainable and competitive path. The IMF has recognized that it under-estimated the fiscal multiplier and that the private debt restructuring in 2012 should have been larger. 7. Many argue that Greece has not made any substantial changes. This is pure hyperbole. The cyclically adjusted fiscal balance has improved by 20% of GDP since 2009. The external position has improved by 16% of GDP. Government employment fell by 1/3 between 2009 and 2014. The retirement age (for men) have been lifted to 67, and pensions have been cut between 15% (for small pensions) and 45% (for larger pensions). The average pension is 713 euros a month. This leaves some 45% of pensioners impoverished. 8. In theory, a devaluation would spur exports. However, Greece's export capacity is poor. A full third of its goods exports are refined petroleum products. Greek exports fall off sharply from there. Manufactured goods account for 13% of Greece's exports. Greece is a small and relatively closed economy. Between 1995 and 2012, Greek exports averaged a little more than a fifth of GDP. Other European countries of a similar size export closer to 50% of GDP. 9. Prior to Greece's latest proposal, the EC indicated that the difference between the creditors demands' and Greece's offers were about 2 bln euros a year. Debt relief, which the EC has conditionally promised is a different story. The cost of Greece leaving will cost more than 2 bln euros in a year. Greece is a buffer state for the refugee problem. The regime change in Libya was a broad decision, but Greece (and Italy) are paying for the resulting refugee problem. The same can be said of the Syria and ISIS. A Greece outside of EMU and EU would also be expensive for Europe. 10. It is generally thought that the official creditors want to make an example of Greece so that other debtor nations do not seek to go the same route. Yet, European action is threatening to make a martyr of Greece, which will embolden the Podemos and other anti-austerity forces. Despite the pressure on Greece, Podemos did well in local and regional Spanish elections.